THE Great Bavarian Mountain Owl is one of the stars of David Walliams’s comedy thriller Awful Auntie, coming to Bath Theatre Royal for ten half-term performances between Tuesday 23rd and Saturday 27th October. 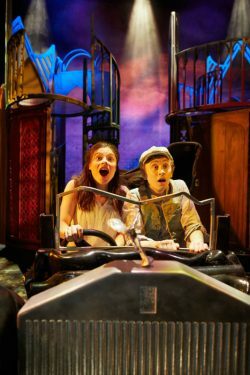 The award-winning children’s book has been adapted for the stage by the producers of Gangsta Granny and David Walliams, and is recommended for everyone aged from five to 105 years. It’s an amazing tale of frights, fights and friendship, brought to life by five actors led by Georgina Leonidas as Stella Saxby. When Stella sets off to visit London with her parents, Lord and Lady Saxby, she has no idea her life is in danger! Waking up three months later, only her Aunt Alberta can tell Stella what has happened. But not everything Alberta tells her turns out to be true and Stella quickly discovers she’s in for the fight of her life against her very own awful auntie! Director Neal Foster says, “I adored the book when I read it and I knew instantly it would make a fabulous theatre show because it is such a gripping story. This is the biggest show we’ve ever staged in our 25-year history. It’s an enormous set to recreate Saxby Hall, a Rolls Royce car, a giant owl, special effects, all wrapped up in the most thrilling story, which unfolds in real time. The role of Aunt Alberta is played by Richard James, an alumnus of Bristol Old Vic Theatre School. The cast also includes Ashley Cousins, with Harry Sutherland and Roberta Bellekom. Footnote. 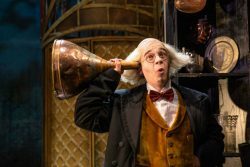 Awful Auntie stops at the Wyvern Theatre in Swindon from 21st to 24th November, and to Plymouth Theatre Royal from 4th to 8th December. Posted in Ragazzata, The Play's the Thing on 19 October, 2018 .